The recently released sparklyr package by RStudio has made processing big data in R a lot easier. sparklyr is an R interface to Spark, it allows using Spark as the backend for dplyr – one of the most popular data manipulation packages. sparklyr also allows user to query data in Spark using SQL and develop extensions for the full Spark API and provide interfaces to Spark packages. Amazon EMR is a popular hosted big data processing service on AWS that provides the latest version of Spark and other Hadoop ecosystem applications such as Hive, Pig, Tez, and Presto. # create the Spark context, for EMR 5.2 use version = "2.0.0", for EMR 4.7/4.8 use version = "1.6.2", and for EMR 4.6 use "1.6.1"
The bootstrap action can also be used to install the Shiny server by passing it the ––shiny argument. Shiny allows users to develop interactive web applications in R and publish their analytics results. 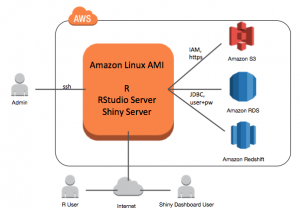 With RStudio and sparklyr running on Amazon EMR, data scientists and other R users can keep using their existing R code and favorite packages while tapping into Spark’s capabilities and speed for analyzing huge amount of data stored in Amazon S3 or HDFS. EMR makes it easy to spin up clusters with different sizes and CPU/memory configurations to suit different workloads and budgets. If you have any questions about using R and Spark or would like share your use cases, please leave us a comment below.